I have had a day of meetings. Some for pleasure, some information, fact finding missions and others focused work. I have been thinking about further study, social enterprise, community building through business, crowd funding,supporting others in business, developing new strategies, defining roles and strategic plans. And you know what…I enjoy it. I enjoy learning about new ideas. I enjoy encouraging others to think about their work, to do it well, to work smart and efficiently so that they can enjoy the reward of good work and more time to be with those they love. If you believe that He is behind it all, then you will know that to work and do it well (….you know to the best of your ability, no grumbling… ) is to worship. What a witness! Whether we are conducting a business meeting, teaching a class, cleaning the bathroom, caring for a sick and aged loved one, we may well be working and worshiping. 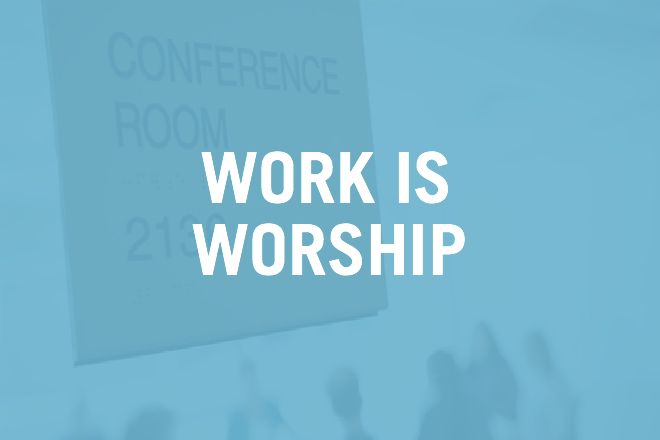 Work is Worship.